The jurors deciding the Terri Supino double-murder case are getting a tour today of the camper where Melissa Gregory was found dead. By showing the jury the camper, prosecutors hope to convey Gregory’s killer must have been a small person, like Supino, because of the limited space inside. Testimony on Monday centered around inconsistencies in Supino’s statements to authorities during her interviews over the years. Prosecutors have questioned why Supino and her brother went to the murder scene the night before the bodies were found and how long they were there. Supino is charged with two counts of first-degree murder for the deaths of her estranged husband, 20-year-old Steven Fisher and Gregory, Fisher’s 17-year-old girlfriend. Fisher and Gregory were found beaten to death on March 3, 1983 at the former Copper Dollar horse ranch northwest of Newton. 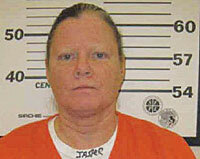 The 54-year-old Supino was arrested at her Altoona residence exactly 31 years after the murders. Her trial was moved from Jasper to Black Hawk County due to pre-trial publicity.